What time of the year do you think is the most demanding on your refrigerator? Of course the summer time when the temp outside starts going up everybody wants something cold or frozen. Your refrigerator has to run more to keep up and so that’s when we see a significant rise in refrigeration calls. One of the key components that cause trouble is a dirty condenser. It causes the compressor to run hotter and reduces the life of the unit. Once a year just like you do with your heating and air conditioning systems get it ready for the season that places the most demand on it. So you bought a new refrigerator and it runs great. It won’t stay that way unless you look after it. The refrigerator needs help to stay running at peak performance. It has coils like a radiator that needs cleaning called a condenser. The condenser is located on the back of some units and in the bottom of the cabinet on others with the compressor, fan and other electronic components. Unlike the refrigerators from years ago, the smaller compressors used today have to work harder to keep up. They are made to be more energy efficient so they are sized to be just big enough to do the job. When they are running they put out a lot of heat and if the heat can’t escape it will shorten the life of the compressor. If you experience compressor failure you will need to call for a refrigerator repair and may possibly need to replace the unit. Be sure to keep those coils clean and extend the life of your refrigerator give us a call today! Clean the seals and the interior of the refrigerator with mild soap or a mixture of baking soda, 2 tablespoons to one quart of warm water. Check the door seal for cracks and for gaps that can let the cold air out. Replace the gasket if there are cracks. If there is just a small gap you can straighten it out by warming it up. Proper cleaning of your refrigerator is important. You should clean spills on a regular basis. Unplug your refrigerator and remove all your food (A good time to see what you should pitch) Take a good look at how your shelves and drawers are ( take a picture) and remove them. Clean the drawers and shelves with soapy warm water. Wipe dry. Be sure to clean the grill with a vacuum. If the refrigerator is not going to be used for awhile be sure to empty all the food and leave the door ajar so air can circulate. If the unit has a latch be sure it cannot be closed and trap a child. Going on a short Vacation? Leave the refrigerator on but throw out opened items and perishables. Turn off your ice maker, check the refrigerator manual to locate the On/Off switch for only the ice maker. 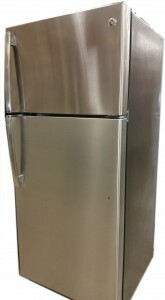 Do you have a self defrosting refrigerator or a Non Self Defrosting Refrigerator? If you noticed a lot of ice forming on the evaporator you either have a non self defrosting unit or a broken self defrosting refrigerator. Do Not use a knife or a ice pick or any other sharp object to get the ice off. If you do you might puncture the evaporator. If you do you will know it by the sound of the Freon escaping. To defrost the unit turn the unit off place some towels in the bottom and let the ice melt. If you have a self defrosting refrigerator and it has ice (like snow) building up on either the back wall or the floor of the freezer you have a defrost problem. This is not a DIY project. Call a professional to repair. Are you moving to a new home and taking your refrigerator with you? When transporting a refrigerator it is VERY IMPORTANT to keep it in an UPRIGHT POSITION. Once you get to your destination, wait a few hours before plugging the unit in. Also be sure it is not plugged in to an outlet with a GFI (Ground Fault Interrupter) Allow time for the refrigerator to come to the desired temperature ( Refrigerator 35’to 40′ and freezer temp -5 to 5+) before loading it with groceries.